Pick the dry years and pare it right back. Pick the wet years and go for broke. I think climate variability in our region is a big issue. It’s a big part of these farms – whether they’re successful or not could depend on how they manage the variable climate that we’re in. Mother nature is moving the pieces on the chessboard, and we need to react. If I see rain coming, I need to think what this means for the clients, and the advice will be completely different depending on their situation. And with climate change, the variability is increasing. I know that my clients know that it’s all about probabilities. But I’m not sure they all understand the consequences of those probabilities. I think they probably have to be optimists to do what they do – they always see the glass as half full. I’m just not sure the reality of increasing climate variability will match those expectations. So I really like to help them out with that. You need to be at the top end of the yield spectrum to cover costs on a cotton crop. And that’s where decision-making tools and climate variability come in. Wetter or drier is probably the thing that I need to be most aware of. If it’s average, it’s average – we just stick to our guns and do what we do. If it’s wetter – it doesn’t matter how much wetter – then we have to do things to try and cover that and make the most of it while we can. If it’s drier, it’s a case of don’t do something stupid. Don’t throw all your eggs out there, spend all your money and expect to get it back. When I discuss options with clients based on probabilities and weather and so on, I find graphs make it almost impossible to argue with. Thankfully, there are plenty of models and computer programs and software that I use as aids. Rain is definitely one of the major variables here. Besides moisture supply, which is rain, there’s also moisture demand. So temperature and wind will dictate how much moisture the crop uses from the soil profile. And those elements are very variable as well. On a hot, dry day, such as when the temperature is 40 °C and it’s windy, the cotton crop could use around 15 to 20 mm of stored moisture per day. Then on a 30 °C day with no wind, it might use 7 mm of moisture. So there is variability on both sides of the equation. Then there’s the variety of the farms in this area. Farmers will take it in turns to jump for joy or curse the heavens at certain weather events because of different cropping decisions they have made. You can grow cotton as an irrigated crop, or you can simply rely on weather, which we call dryland or rain-grown cropping. The inputs are dramatically different between irrigated and dryland cotton. For irrigators, expenses are orders of magnitude larger. Then they have to think about how the weather affects their irrigation: how often they irrigate, when they start, when they stop. The irrigators are busy, very busy. But irrigators can grow higher yields and get more returns per hectare than dryland growers. A dryland crop could probably grow around 2.5 to 4 bales per hectare, where irrigated crops would grow 12 to 15 per hectare. Irrigators have a finely tuned management strategy; they tend to start with a very high yield potential, and the weather will bring it down. For irrigators, the intensity of rainfall in the catchment is useful because intense rain will run off, end up in the river and then into a dam. If the water gets captured in the dam, then it can be useful for environmental purposes as well as for irrigating crops. With dryland cotton, you get some rain, and the yield will go up; then it’ll be dry, and yield will come down – up and down, up and down. The biggest risk in growing dryland cotton is not getting it planted, followed by not receiving adequate in-crop rain. We don’t put all our eggs in one basket. It is challenging to know which is the right way to go with climate, given the variability is so high. So we manage it by rotations with different crops. There’s a system in this region that we call a 5-year rotation or 5-year crop sequence. An example would be a cereal crop followed by legume, then cereal then long-fallowed to summer crop. So each fifth of the farm will be allocated to a section of the rotation each year, thus spreading risk. Rain will affect different crops differently. Here, with many different crops grown simultaneously, if it rains at any time, it will have a good impact on the outcome of at least one of those groups. For instance, barley grows at different times of the year to other crops such as wheat and chickpeas. It tends to be sown at the early end of the window. It matures earlier than wheat and chickpeas, so we can get harvesting earlier, get trucks delivering some grain earlier and so on. It gets some of those paddocks over and done with before the others come in. That manages both weather risk at harvest and rain during the season at different times of the year. Each crop plays a role in managing the risk over a 5-year period. It’s about trying to even out gains and losses over the longer term. We got away with blue murder last winter . We had a very dry summer, so coming into autumn it wasn’t great. There was meant to be a roaring El Niño that winter. Between that and the Indian Ocean Dipole, it was supposed to bring more rain than average for April and May and then dry out. Our outlook was not good. But it turned out to be very wet in April, May AND June – it was 60 mm most of those months. The crops are now looking beautiful. It is all about making money. You make money storing water in the ground and getting the most out of the water. You can’t make money on the dust. Irrigated cotton growers need water to make money. The erratic nature of the climate is an issue. Intense storms and rains are great for storing water in dams, so that will benefit the irrigated cotton growers rather than dryland growers. But the availability of water is getting tighter and tighter, plus there are more mouths to feed. Everyone understands the importance of water for the environment. In the past, irrigators got the lion’s share, but now it’s more evenly shared, so there is less available and it’s harder to get a piece of the action. You have to remove a lot of the emotion from farming; it is a business, regardless of what you grow. You need to get the science in there and start using best practice. In the distant past farmers would sow ten wheat crops in a row and would wonder why the last couple of crops are so poor. 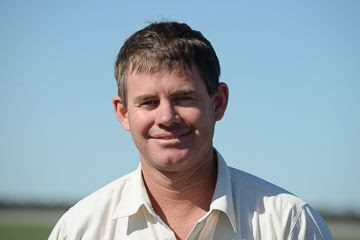 It is difficult to not plant a crop when there is moisture in the paddock – you have to be dedicated and consistent in carrying out that action of not planting it – because yes, you’re there to make money out of the moisture that’s in the ground, but you’re also there to reduce all the costs you can in the future by not having weeds and not having diseases eat away at your yields. This means controlling weeds with herbicides that don’t create resistance. And you have to have a spread of crops (wheat, barley, chickpeas, sorghum, cotton) each year, and one crop will suffer, but this is the best way to manage the climate going forwards. I’m always on the lookout for, and trying to get to grips with, potential new tools. As far as weather prediction goes, we use the 7-day forecast, 10-day forecast and a little bit of an educated guess on the 3-week forecast. From then on it’s pretty much guesswork at present. I think the Bureau of Meteorology’s Predictive Ocean Atmosphere Model for Australia (POAMA) models are exciting. POAMA certainly seems better than what we’ve got. POAMA uses physics to make predictions on the weather, and this makes a lot more sense to me than using statistics to work out what’s going to happen. I access POAMA quite regularly. It’s easy to access, although I do find it challenging to interpret the data. I got involved in the Managing Climate Variability Climate Champion program so I could learn about how climate and weather work. I want to be part of the whole system. I want to learn from it. I would like to advise more clients with even richer information. I would like to be a more informed member of my networks with Cotton Research & Development Corporation, Grains Research & Development Corporation and others, to know more about any gaps in knowledge and what technology is available or not. Forecasting and how models work is the next big input into making farming more efficient, so I very much want to be a part of that. There’s a need for this program. There are businesses that make a margin having quality product grown and manufactured appropriately. And that’s what this program encourages and draws attention to. 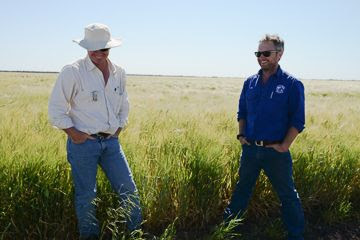 Rob (left) is a consultant for a number of cotton farmers in the area. 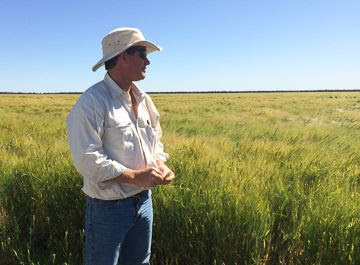 To help spread seasonal risk, Rob rotates crops across the farm, including barley. JR McDonald, another of Rob’s clients, tests soil moisture. 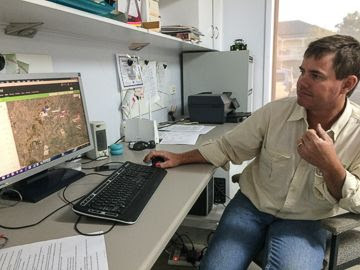 Rob says understanding how modelling works is the next big step in farming more efficiently. Rob and JR McDonald discuss practices for managing climate variability.